1. In a large pot, bring 5 inches of water to a boil. Plunge the lobster into the water head first. Be sure that the entire body of the lobster is below the water. Bring back to a boil, reduce heat, and simmer for 10 minutes. Then, remove the lobster from the water and plunge into a large bowl of ice water. 2. When the lobster is cold, remove it from the water. To remove the meat, a. First twist the tail from the body. Then, remove the tail fins by snapping them backwards. To remove the meat from the tail, place the tail on its side on the cutting board. Using a kitchen towel, press down firmly until you hear the tail shell break. Then, separate the underside of the tail by pulling the shell apart on each side. b. Next, remove the claws from the body by pulling the claw toward the top of the body until it pops off. Break the actual claw from the arm. Remove the meat from the claw and arms using a meat mallet or special shell crackers. 3. Cut the tail meat into large dice. Cut each claw in half. 4. In a bowl, fold the tail, claw, and arm meat with the mayonnaise, tarragon, chives, lemon juice, and black pepper. 5. Meanwhile, cut a thin slice off of each side of the hot dog bun, cutting lengthwise. Butter the sides well with the butter. Place the bun cut side down in a saut� pan over moderate heat. When browned on one side, flip to the other buttered side. 6. To complete the sandwich, remove the bun from the saut� pan and cut a deep slit in the top of the bun. 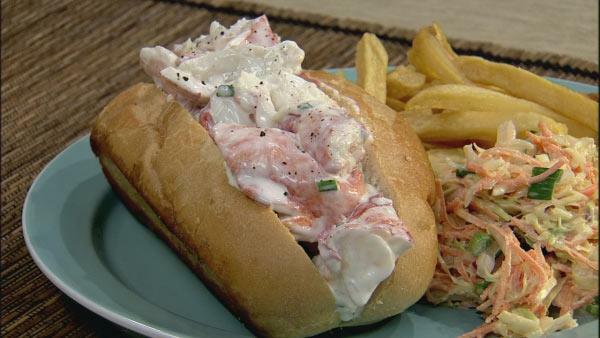 Immediately fill with the lobster meat mixture into the warm bun. **The hot dog bun should have some consistency and not be the very light and fluffy buns that are commercially produced.